The model 438UPI (Potentiometer Adjustable Interval Time Capsule) is an all Solid State In-Line timing device providing Interval timing control of any load device operating from 115 or 230V AC or DC. 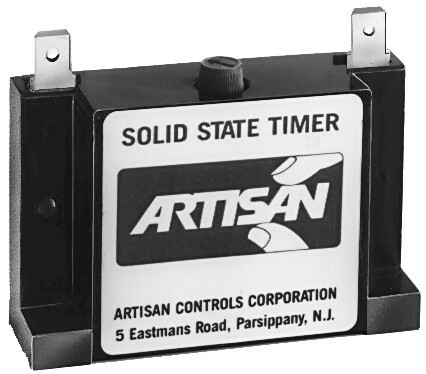 Timing is set via a potentiometer located between the input terminals and is adjustable from 5-480 seconds. When power is applied, the 438UPI turns On permitting full load current to flow. At the end of the preset timing period the 438UPI turns Off and permits only leakage current to flow through the load. Operating Voltage 115 to 230VAC or DC. Frequency 50/60 Hz for AC inputs. Output 10 milliamperes to 0.25 ampere inductive. Inrush to 8 amperes for 8 milliseconds. 10 volt maximum drop across timer when output is ON. 3mA leakage current through timer when output is OFF. Timing Range 5 to 480 seconds.